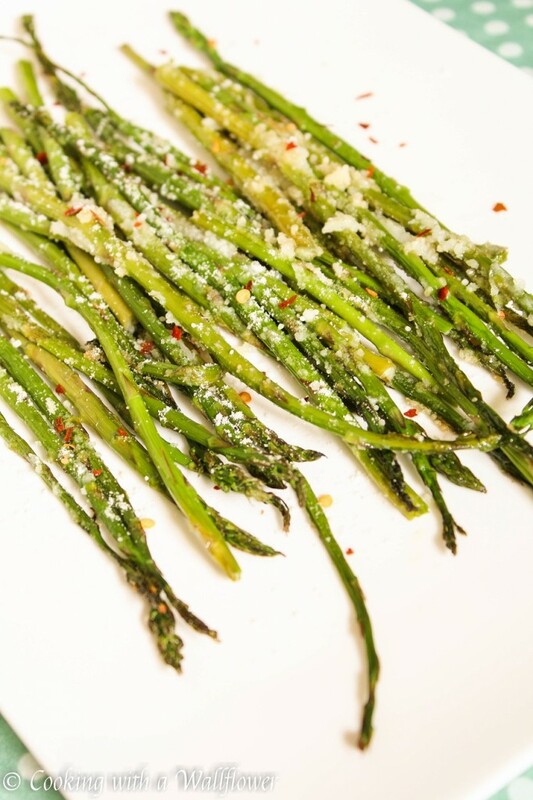 Roasted asparagus topped with parmesan and crushed red peppers. 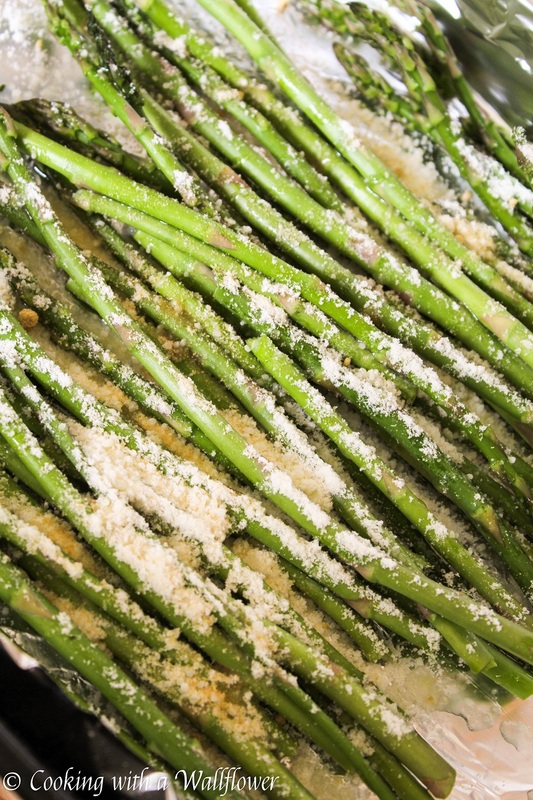 This Roasted Parmesan Asparagus is the perfect side to any dish. 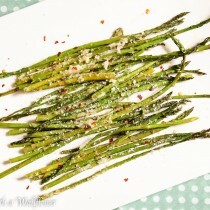 One of my most favorite ingredients to use during the spring is asparagus. I know. I know. Not everyone feels the same way about asparagus as I do. But! Asparagus has soo many health benefits. It has tons of antioxidants which help to reduce the risk of common chronic health problems such as diabetes and heart disease. It supports digestion and has anti cancer benefits. So if you can ignore the downside of eating asparagus, then you can get all these benefits from consuming this in season vegetable. I love that asparagus is so easy to use. You can cook them with pasta, add them to pizza, toss them in salads. So many options! Today, I decided that I just wanted to feature them on their own as the main ingredient. Simple, quick to make with little preparation involved, this roasted asparagus dish is absolutely delicious and healthy. So what are you waiting for? It’s time to go out and buy them. I’m positive you can find fresh asparagus at the Farmer’s Market right now too. And if you’re like me, I’ll take any excuse to go shopping at the Farmer’s Market. First, preheat the oven to 400F. Line a baking pan with foil and lightly grease with olive oil. Wash and dry the asparagus. Remove the woody bottom part of the asparagus by slicing off an inch or just breaking it. Place the asparagus stalks on the baking pan. 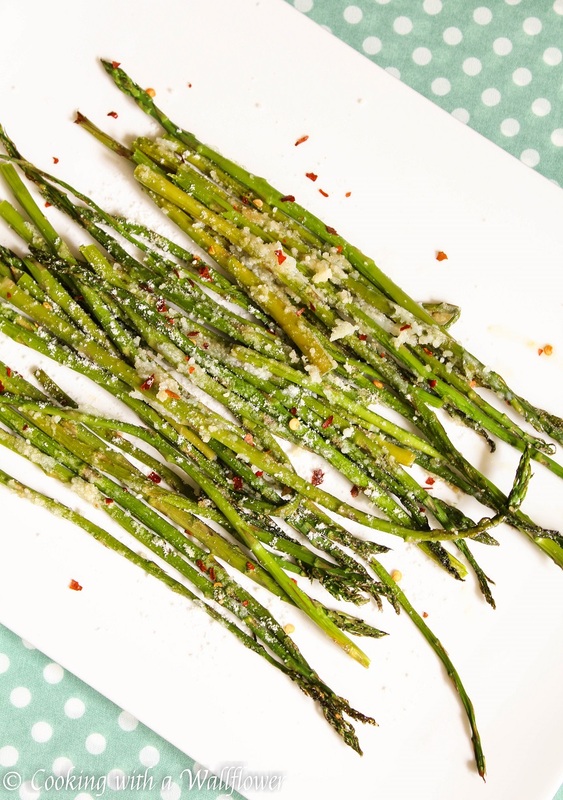 Drizzle about a tablespoon of olive oil over the asparagus. Sprinkle parmesan cheese on top and a pinch of salt. You can also add a little bit of crushed red peppers if you like spicy. Place the baking pan in the oven and roast the asparagus for about 10-20 minutes until the stalks are tender. There’s a huge difference in how long the asparagus should be roasted because the stalks come in different sizes. If your asparagus stalks are thin, 10 minutes will be long enough for the asparagus to become tender. If they are thick, it could take up to 20 minutes. So depending on how thick the asparagus are, the time will also vary. Once the asparagus has become tender, remove the asparagus from the oven and let them cool for a few minutes. 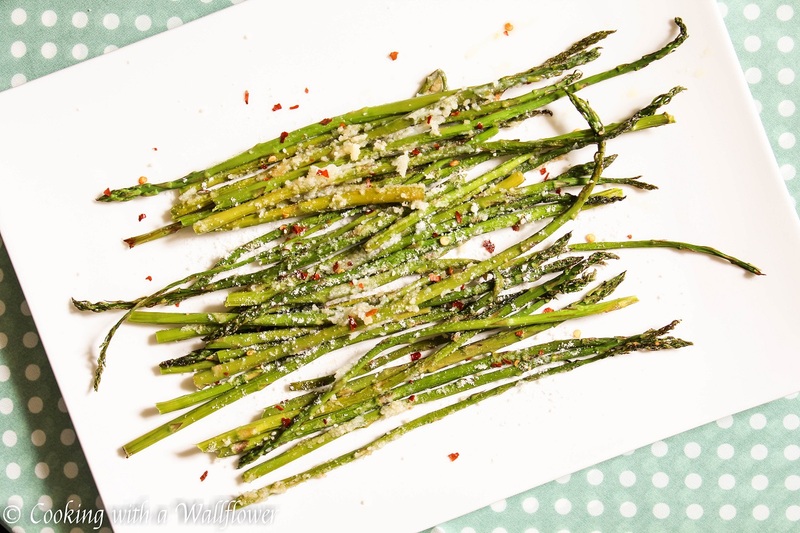 Serve the asparagus warm as a side. Preheat the oven to 400F. Line a baking pan with foil and lightly grease the bottom of the pan with olive oil or nonstick cooking spray. Place the asparagus on the baking pan. Drizzle the olive oil over the asparagus. 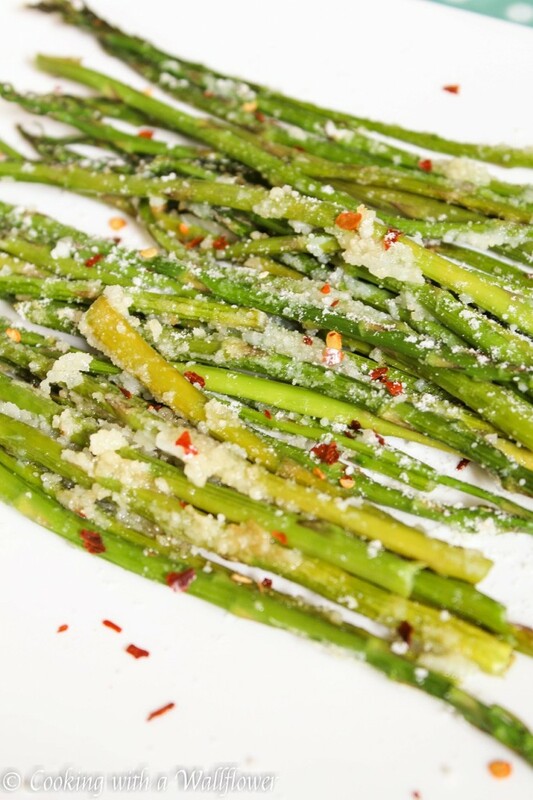 Sprinkle the parmesan cheese over the asparagus, a pinch of salt, and crushed red peppers if desired. Roast the asparagus for about 10-20 minutes depending on the thickness of asparagus. 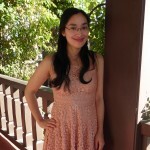 This entry was posted in Appetizers, Gluten Free, Healthy, Quick and Easy, Recipes, Sides, Spring Cravings, Vegetarian and tagged gluten free, quick and easy, spring, vegetarian.